Using big data gives organizations insight into their operations and industry that were unparalleled just a decade ago, and we can count on that growth continuing well into the future. 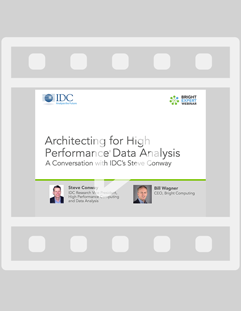 Data sets continue to grow both in size and complexity, driving the need for high performance data analysis systems. There are many database and analytical software packages available today, yet implementing them into a reliable enterprise-ready system remains a challenge. Once big data projects move beyoned the pilot stage into production, there is a need for end-to-end management solutions to keep them running at their best. Modern data scientists are using AI techniques to extract actionable insight form their data. Bright lets the work with all fo the popular deep learning frameworks and libraries. "We have access to a tremendous amount of existing technology in traditional HPC clusters, and will use the Bright-powered big data cluster as a test bed to see how different technology might make our simulations easier to implement or speed up processing." Installs everything you need, including your chosen distributions of Linux, Spark, libraries, and more. Bright’s configuration groups make Spark configuration more flexible than ever. A single, intuitive interface for all cluster management functionality). Includes the most popular machine learning libraries and frameworks such as NVIDIA cuDNN, DIGITS, MXNet, pyTorch, Caffe, Caffe2, CNTK, Torch, Tensorflow, Theano, and more (see Bright for Deep Learning for details). 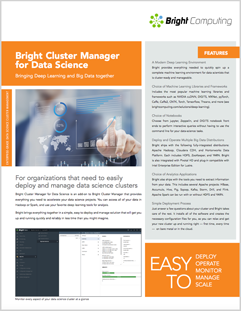 You can rest assured that the cluster is running the way it should, and if it’s not, Bright Cluster Manager will let you know. Want to see Bright for Big Data in action?